experience and perspective to every engagement. We are often asked about the origin of our name - OMS117. OMS is an acronym for Olivas Mission Success. This embraces our philosophy that -- for our clients -- success isn’t just desirable, it’s the only acceptable outcome. 117 refers to the NASA mission, STS 117, when our team leader, John “Danny” Olivas and six astronaut colleagues traveled to the International Space Station aboard the Atlantis space shuttle. tackle the most uncompromising challenges. Mission Assurance is a methodical technique for analyzing all safety aspects of products, projects and processes. OMS117 investigates, analyzes and mitigates mission-critical engineering issues. Prevention - avoiding costly events before they occur. Remediation - determining how these impactful events occurred and ensuring that they do not happen again. Training - tailored to individual companies, products and processes. John "Danny" Olivas, Ph.D., P.E. worked at NASA for 12 years on many technical projects (on land, in the air, at sea and in space). Olivas also served as an astronaut on two space shuttle missions, STS 117 and STS 128. As an astronaut, Olivas logged more than 650 hours, 440 earth orbits and 11 million miles in space. Olivas participated in 5 space walks totaling 34 hours, including the first ever space walk to repair the shuttle while in orbit. 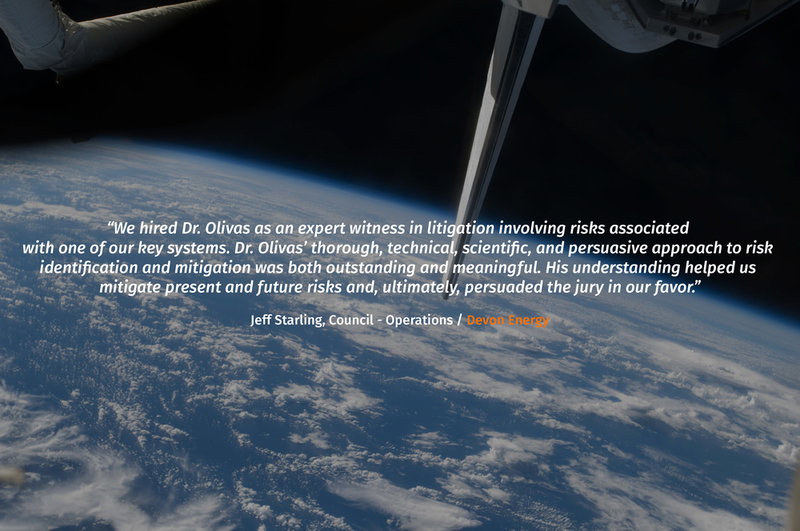 On earth, Olivas’ prestigious assignments have included working for Dow Chemical, Jet Propulsion Laboratory, Raytheon Space and Airborne Systems and the University of Texas at El Paso. He has a Ph.D. in mechanical engineering and materials science from Rice University. He lives in Southern California with his wife and five children. For close to 20 years, Olivas has served as a legal expert witness in the areas of mechanical engineering and materials science. Through his training, experience and passion for Mission Assurance, he leads OMS117, LLC to help organizations avoid pitfalls which result in significant claims, injuries, loss of life or property.